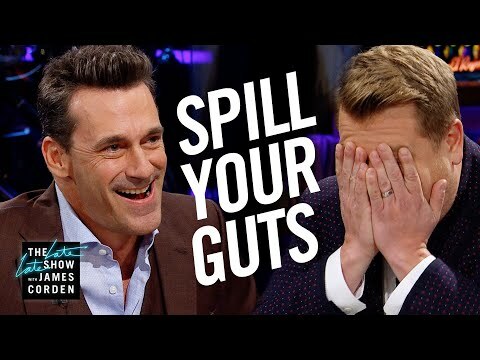 Jon Hamm and James Corden take turns choosing between answering very personal questions or eating stomach-churning foods, like bird saliva. More Late Late Show: Subscribe: Watch Full Episodes: Facebook: Twitter: Instagram: Watch The Late Late Show with James Corden weeknights at 12:35 AM ET/11:35 PM CT. Only on CBS. Get new episodes of shows you love across devices the next day, stream live TV, and watch full seasons of CBS fan favorites anytime, anywhere with CBS All Access. Try it free! --- Each week night, THE LATE LATE SHOW with JAMES CORDEN throws the ultimate late night after party with a mix of celebrity guests, edgy musical acts, games and sketches. Corden differentiates his show by offering viewers a peek behind-the-scenes into the green room, bringing all of his guests out at once and lending his musical and acting talents to various sketches. Additionally, bandleader Reggie Watts and the house band provide original, improvised music throughout the show. Since Corden took the reigns as host in March 2015, he has quickly become known for generating buzzworthy viral videos, such as Carpool Karaoke."